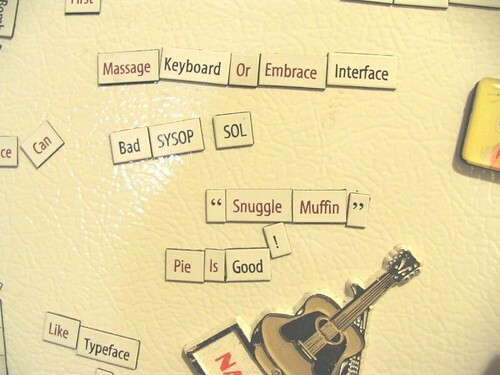 10 years ago when we bought our house, we put a set of fridge poetry magnets on it, with the theme "computers". Then I got another set with the theme "romance". Put them together and this is what you get. I finally decided that after 10 years it was probably time to take the magnets down. Some of the phrases had been there in the same position for 10 years now. But they were funny, so I took photos.